Of the waste, nearly 40 per cent is used for generating RDF, which is produced from various types of wastes, including municipal solid waste. 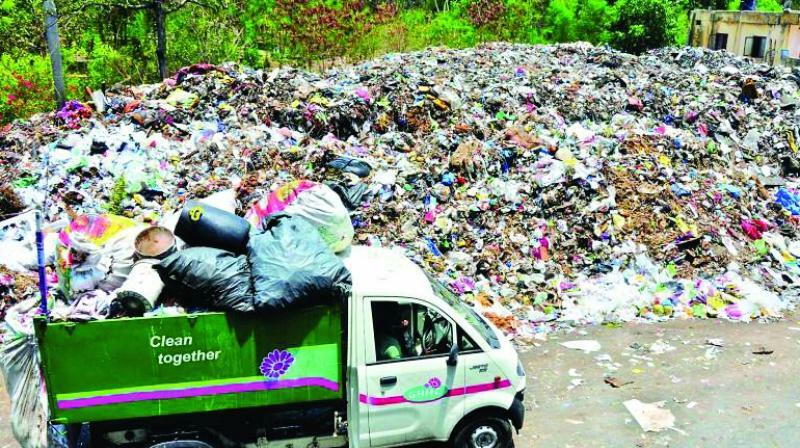 Hyderabad: The wait of locals and residents of nearby localities for the 100 per cent processing of all the garbage that reaches the Jawaharnagar dump yard just got longer. They will have to bear with the pollution for more time. The GHMC had promised to process all the garbage by October this year. Corporation officials said that civil works have been going on at a brisk pace but the machinery to process wet and dry garbage is yet to land from China. The corporation had signed an agreement with Ramky Enviro Engineers for the purpose. The company has placed the order but the machine would be delivered only by January. Officials said that the operations would begin from March next year, when the machine would use the garbage to produce energy, bricks and compost. Ramky would set up waste-to-energy plants with 48 MW capacity in public-private-partnership mode. Though the initial plan was to set up two units of 24 MW capacity each, the idea now is to split the capacity into different plants and set them up at the newly identified dump sites. The corporation has identified a site each near LB Nagar, Dundigal and Sangareddy The garbage that will be dumped at these sites will be processed the same day, thereby preventing stench and environmental hazards such as formation of leachate. Sources said that the corporation had persuaded local residents to locate the dump yard in the area. A senior GHMC official said that the work was delayed as the Infrastructure Leasing & Financial Services (IL&FS), which was part of the public-private-partnership project, had walked out of it. He said after holding several discussions it had been decided that Ramky Enviro Engineers would be the concessionaire for solid waste management. The capital cost of the 19.8 MW waste-to-energy plant will be between Rs 15 crore and Rs 18 crore per megawatt (MW), an official said. About half the construction was done and it would be ready by March. This unit cannot use the entire waste being processed in the dump yard, which weighs approximately 5,000 tonnes per day. The GHMC official said the remaining capacity will be achieved eventually.